Metals are by far the fastest growing segment of 3D printing, and allow the technology to be used not only for rapid prototyping but also to manufacture final production parts in a variety of industries. 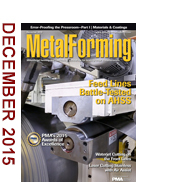 PMA, in partnership with MecklerMedia, New York, NY, is pleased to launch 3D Metal Printing magazine in Spring 2016. The publication promises to be at the center of this exciting industry, keeping readers in tune with new-technology write-ups, application articles and tutorial “how-to” features. Subscribe to receive 3D Metal Printing. > Thanksgivings to Come: Printing the Bird? From laser cutting to stamping to resistance welding, this 90-sec. slickly produced YouTube video taken inside the 5.3-million-sq.-ft. Tesla factory in Fremont, CA, is well worth watching. As noted in the description, the plant’s white floors are “clean enough to eat your dinner off of.” Take a brief diversion from your busy day and take a look at the plant’s recently revamped assembly line, body shop and powertrain assembly facility. The Precision Metalforming Association (PMA) used the FABTECH stage in Chicago on November 8 to present its 2015 Awards of Excellence in Metalforming. Presented annually, the awards recognize the high standards of achievement set by the metalforming industry in the areas of design, product development, safety, process control, quality, productivity, and training and education. "From Stone Age to state-of-the-art" is how Perfection Fabricator's president describes the addition of waterjet technology. The new equipment has cut delivery time, allowed fabrication of diverse materials and positioned the company to better serve its customers.